Fëanor Exiled (4990 F.A.) - Though he was freed from imprisonment, Morgoth was confined to Valinor in order to remain under the watchful eye of Manwë and the other Valar. This was not to his liking, so he schemed at how he could he could escape his confinement. With his treacherous tongue he sowed division between the Noldor and the Valar, convincing some of the Noldor that they were also being held by the Valar against their will. This brought dissent between Fëanor and his brother Fingolfin. Fingolfin sought the counsel of their father, Finwë, which Fëanor mistook as an attempt to usurp his birthright as the older sibling. "Now the unrest of the Noldor was not indeed hidden from the Valar, but its seed had been sown in the dark; and therefore, since Fëanor first spoke openly against them, they judged that he was the mover of discontent, being eminent in self-will and arrogance, though all the Noldor had become proud. 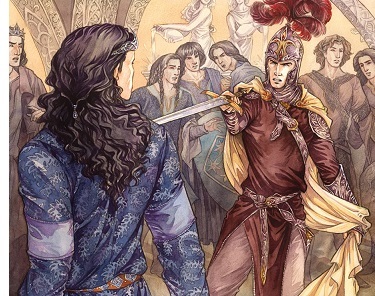 As punishment, Fëanor was banished from Tirion for twelve years. But he did not go alone. A great host of Noldor left with him, including his seven sons and even his father, Finwë, the king went with him. And so, Fingolfin became king of Tirion. 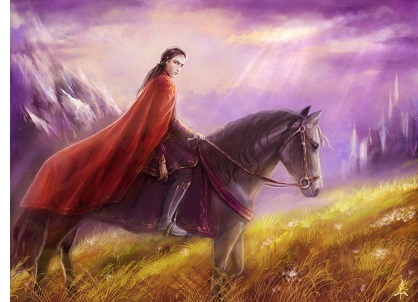 Fëanor and his troupe traveled to the northern end of Valinor and established Formenos as their new home. But Morgoth caught wind of the judgement and escaped capture.